F-1 India: Is F-1 insignificant in India? Is F-1 insignificant in India? I was watching the news lately and was shocked to hear that Formula -1 was declared as an insignificant game in India by our sports ministry. 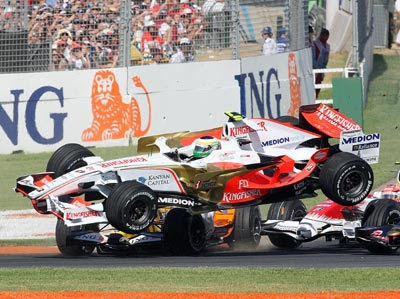 To quote our sports minister, “F1 is not purely sports. It is entertainment and this venture by JKSP is a commercial initiative. The proposed F1 race does not satisfy conditions which focus on human endeavour for excelling in competition with others, keeping in view the whole sports movement from Olympics downwards." Now this is something neither I nor anyone who is an F-1 fan will agree to, you cannot classify F-1 as a sport even when you know that it is third only to Football and Olympics in TV viewership. On a single race there are more than 600 million fans watching the race all over the world. Also the sport was considered insignificant in India because of lack of audience and fans. I dont think we are short of fans and there is a large fan following that can build up a descent enough number to match other countries where F-1 IS considered a sport. this is an appeal to all fans of F-1 to please submit any comments and reactions to support the advent of this highest class of autoracing in India. Copyright 2009 : F-1 India: Is F-1 insignificant in India?